A sleek 6mm cobalt ring featuring a delicate double milgrain detailing. 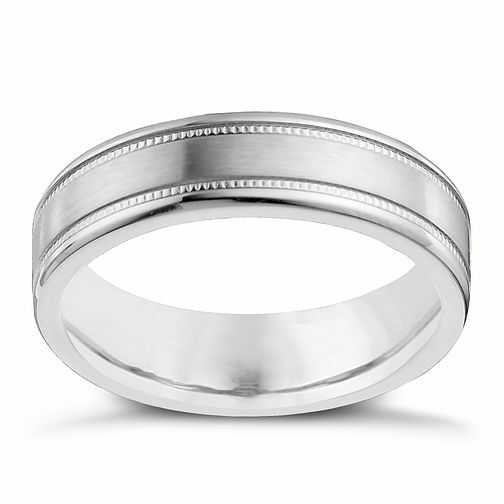 The perfect wedding band or simple, everyday ring. Cobalt 6mm flat double milgrain ring is rated 4.8 out of 5 by 4. Rated 5 out of 5 by Anonymous from quality shape the detail pattern I wanted a ring for my husband which looked expensive but was a reasonable price and that,s just what i got .When I opened the box it was in I was nervous having picked it from a picture on line I need not have been it is stunning it fits perfectly the quality is excellent for the money paid it looks expensive much more than I paid.As for delivery I ordered it and it came the next day well wrapped I am thrilled with my purchase and would recommend Ernest Jones every time wonderful experience. Rated 4 out of 5 by Anonymous from Gorgeous ring I too bought this as my husband's wedding ring. It looks gorgeous on, it's by far the nicest men's ring I've ever seen. It has such subtle detailing. My husband needed cobalt as he has very sensitive skin and precious metals may have irritated it. The only downside is that its size can't be adjusted to allow for weight gain or loss, but we've circumvented that by buying a couple- at this price, why not!